In this article I'm talking about summer holidays. That yearly tradition that the vast majority of us take part in, the exclusion of which is deemed almost as a deprivation of one's rights. I think it goes without saying that everyone loves to go on holiday. A little trip away helps to break up the monotony of our daily lives, giving us time away from work or studies, a little time to recharge our batteries. It's also good to have something to look forward to as well, the knowledge that you'll be heading off somewhere on holiday in x weeks' time giving you that extra drive to get through the daily drudge. 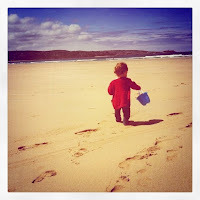 Last year we were lucky enough to spend our family holiday in Cornwall, England, combining scenic countryside with beach-side fun, although it was somewhat dampened by the torrential rain for half the time we were there. Still, it allowed us to experience something different, and Lydia was able to play on a sandy beach and dip her toes in the chilly sea for the first time in her life. This year, unfortunately, money is a bit tight, so we are looking at simpler options. Rather than splash out on flights or expensive hotels, we are looking at staying somewhere in Switzerland and finding something that is both relaxing for us and enjoyable for Lydia. One potential option springs to mind - Switzerland has a plethora of camp sites dotted around the place, near lakes or in mountain villages. This, to me, seems like a great holiday idea. Cheap enough to be affordable whilst still having that sense of freedom to do what you want. I haven't been camping since I was in the Cub Scouts many years ago, apart from a brief weekend staying in a tent at the V Festival in 2002, and have some pretty happy memories of those trips. I've long fancied going camping again somewhere and really doing it properly - putting up a tent, building a camp fire, etc - but I think this might be a bit beyond Lydia for the time being. She would be a little over 2 years old this summer and that's simply too young for that kind of holiday. It's an option I will keep in mind for future holidays, but probably not for this year. Precluding camping trips means one of the cheaper holiday options has to be left out of the search. Instead, we could perhaps focus on holiday camps that have lots of children and activities for the little ones to busy themselves with. Something like Center Parcs would be ideal, but sadly they don't have a site in Switzerland. The perfect holiday would be a little holiday home (like a villa or a chalet) in the grounds of a holiday camp that has at least a small terrasse and/or garden, located in a nice, scenic area and possibly near a lake. Oh, and not too expensive. Think that might limit our options somewhat! I have tried searching on Google to see what's out there, but it seems quite difficult to actually find something suitable. This might be partly because things in Switzerland are a bit on the expensive side, but possibly also because I'm not entering the right search parameters. Either way, I'm struggling to find what we could do and where we could go for this year's family holiday. There is another limiting option that also hinders this search - the language. I'm a native English speaker who has picked up French since moving to Switzerland, and my wife is bilingual (French and English). Lydia, growing up in a home where both English and French are spoken is naturally picking up the two languages. I'm focusing my search on Switzerland to try and keep costs (such as travel) to a minimum, but the problem is that two-thirds of the country is in areas where Swiss German is the spoken language, such as Zurich, Basel, Bern, etc. From our point of view, it would be much preferable to stay in the Suisse Romande part of Switzerland, as it's French-speaking and therefore won't require me to take a crash-course in Swiss German or Swiss Italian (or even Rumansch!). This is not just for our benefit, but also to make sure Lydia can communicate with the other kids she meets without too much frowning or reliance on hand gestures. As I said above, this is further restricting our field of search and therefore reducing the options available. It means we are looking at the cantons of Geneva, Vaud, Valais, Fribourg and Jura. It would be nice to get away from Vaud though, as it would feel more like a holiday if we were further from home. My searches have so far been fruitless, but that's partly why I have written this article. I'm calling for suggestions from all the helpful people out there in Internet-land who know of a holiday idea that just might tick all the boxes. Any hints or suggestions would be greatly welcome - either leave a comment on this article or drop me an email to: erniemcpeck@gmail.com. I will follow up this article with future updates on any ideas that come to me from the good people out there, plus any I think of myself, as this just might help others who are in the same situation as me. Of course, any suggestions I receive will be fully credited to the kind person who suggested it! As a back-up option, if I can't find anything suitable in Switzerland then I might consider expanding my search to include places in France, in case the ideal holiday is waiting for me in our neighbour country. Therefore, if you have any tips for great holidays in France then please let me know! That being said, it would still be preferable to stay in Switzerland. Thanks in advance to anyone willing to help an expat out!